Kevin Hart stars in a new MTN DEW KICKSTART commercial, revealing what really goes on inside of his head when he gets that refreshing boost from a MTN DEW KICKSTART. The 30-second spot, created by BBDO, features the actor/comedian revving the engine of a neon-green colored chopper as the situation taking place in his head while he’s actually drinking MTN DEW KICKSTART. “Give Your Head A MTN DEW KICKSTART,” he says at the end of the commercial, which also showcases the MTN DEW KICKSTART range. The soundtrack is the 2015 single “New Level” by A$AP Ferg feat. Future, from Ferg’s second studio album, “Always Strive and Prosper”, released in 2016. 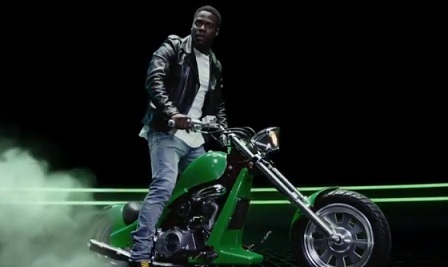 Kevin Hart was introduced as the New Face of MTN DEW KICKSTART earlier this year, on February 16, when the “Closer Than Courtside” 360-degree marketing campaign was launched. He signed a one-year deal with the Pepsi Co.-owned brand On the same date, two new MTN DEW KICKSTART flavors were unveiled, namely Original Dew and Ultra Original Dew. MTN DEW KICKSTART Original Dew brings the flavor of original Mtn Dew with a boost – containing 80 calories and 91mg of caffeine per 16 oz. can. MTN DEW KICKSTART Ultra Original DEW contains five calories, no added sugar and 91mg of caffeine per 16 oz can. Both flavors contain five percent juice and Vitamins B and C. The MTN DEW KICKSTART range, now available nationwide, also includes other flavors, like Orange Citrus, Fruit Punch, Midnight Grape, and Mango Lime. “People always wonder what goes on in my head and I don’t blame them. There’s a whole lot going on in there folks, and now you finally get to see what pumps me up – spoiler, it’s me,” said Kevin. “What’s great about this MTN DEW KICKSTART partnership is that we get to have fun with it. Between bringing a fan courtside at a NBA Playoff game to filming these commercials, I’m proud of the work we’re doing and hope the fans will enjoy it, too.” Hart said of his one-year partnership soft drink brand.